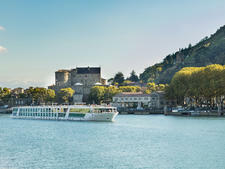 Since its launch in 2013, Emerald Waterways has built a reputation for value river cruising on contemporary boats, with gratuities and transfers among the extras included in the fare. The 182-passenger Emerald Sun follows the line's template, with smartly designed cabins, a heated indoor pool that turns into a movie theater at night and comfortable modern decor that is attractive yet cozy enough for lounging. Where Emerald Sun shines is in this casualness, which never seems forced. It's a ship to kick back -- there are no frilly or formal furniture, lighting or curtains -- and no one puts on airs. 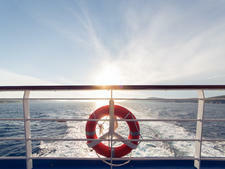 The line draws an international mix of English-speaking passengers, with the dominant culture depending on the sailing. On our December holiday market cruise, the festiveness of the season was heightened by a decidedly younger demographic, bookended by a group of 30-year-old Americans celebrating the milestone birthday with their parents. We found everyone on the boat friendly, however, regardless of age. For most, Emerald Sun was their first river cruise and the consensus seemed to be that on the vessel, passengers were receiving good bang for their buck. 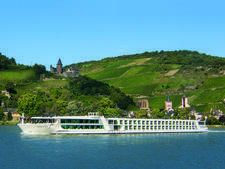 River cruisers who are used to a higher-end experience, however -- such as that provided by Emerald Waterways' sister company Scenic Cruises -- may be put off by some slippage in the details. Our cruise did not have enough wait staff to handle the dining room, for example, particularly during the morning and lunch rushes. Despite a later-than-usual bar scene, waited lounge service often ended rather abruptly, with no warning. Dining in general, while ambitious and interesting on paper, was underseasoned and overcooked. Shore excursion guides were not the quality you'd expect; we found the enticing draw of the Christmas markets to outweigh the commentary. That being said, our Emerald Sun experience had some truly standout moments. We loved the cruise director Balazs, who has won line awards for his enthusiasm and service. Having a movie theater onboard (with popcorn!) provided an evening alternative to the self-important lounge singer. An included shore excursion to a private home outside Bratislava provided insight into local life. The Bavarian buffet, with beer, sausages and pretzels, won rave reviews. The line actually ran its EmeraldActive tours, such as biking the Wachau Valley and hiking to Durnstein castle, for a few hardy souls who didn't mind the frosty weather. And the boat's cheery holiday decorations -- and an awesome specialty coffee machine -- made the lounge a homey refuge from the chilliness of the air outside. 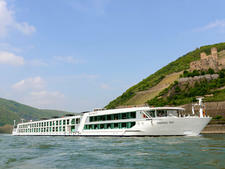 All in all, Emerald Sun makes a nice introduction to river cruising, and we suspect that some of the issues we encountered might be alleviated during the regular season (unlike some other river cruise lines, Emerald Waterways shuts down its boats between October and December, which means the Christmas Markets crews are cobbled together for a few short sailings). Considering the extras that you receive in the fare, an Emerald Sun cruise represents a great value amid attractive spaces straight from Restoration Hardware Modern that you might want to copy in your own home. 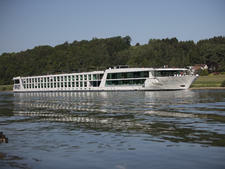 Emerald Sun draws English-speaking passengers from around the world. 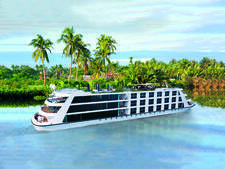 The parent company, Scenic Cruises, is Australia-based, and so you'll always have a few people from Down Under. Emerald Waterways is big in the U.K. as well. Age-wise, Emerald Waterways attracts a mix of couples, friends and families of adult children traveling with their parents in their 50s, 60s and 70s. 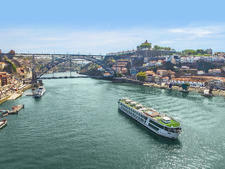 Millennials on river cruises are still unusual; however, our sailing had a group of American college friends celebrating their 30th birthdays with their parents and spouses. Emerald Sun is decidedly casual. During the day, passengers wear T-shirts, tops and sweaters, with jeans and leggings. In the evening, women may change into a different top, but you'll still find jeans and casual pants most nights, while men might switch into a collared shirt. Twice during the sailing, the boat has a "welcome dinner" and a "farewell dinner" that are considered more dressy. On our sailing, this usually meant women put on a festive sweater or a casual dress. A handful of men wore jackets, but they were in the minority and a jacket or tie is not required. In Europe, you'll want to bring comfy walking shoes, as well as raincoat or winter coat and accessories, depending on the season. Emerald Sun has a small gym onboard, as well as a fleet of bikes to use, so if you want to exercise, you'll need fitness clothes. Finally, the ship has a swimming pool so don't forget your bathing suit. 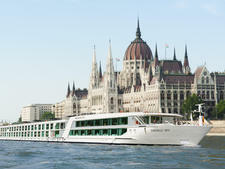 Emerald Waterways river cruise fares have a nice range of inclusions, with gratuities and transfers included. We loved having large bottles of still and sparkling water in our cabin that were constantly replenished; you also get bottled water for excursions. At least one excursion is included in each port, and in some ports, there's an active excursion involving hiking or biking. All walking tours also have a gentle walking option; still, those with mobility issues should talk to the cruise director before heading out. Beer, wine and soft drinks are complimentary at lunch and dinner. Wi-Fi is also included.